LANSING, Mich.—Wednesday, Feb. 11 was a special night for Mr. George Barnett and his family. To celebrate their son’s birthday, the business owner and his wife Annette drove all the way from Macomb, an hour and a half drive. 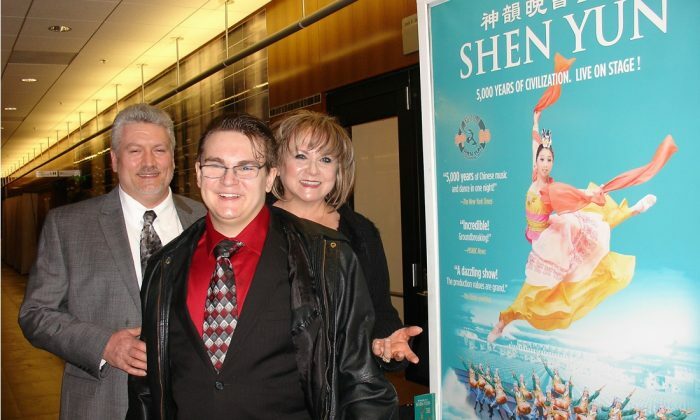 “It was amazing!” said Mr. Barnett after attending Shen Yun Performing Arts’s Lansing debut. The company performed at the Wharton Center for Performing Arts located on Michigan State University’s campus. “It was amazing. The solos were amazing. The choreography was amazing. The costumes!” said Mr. Barnett. Some of Shen Yun’s classical Chinese dances tell of ancients legends, others take place in modern day China. These are about Falun Dafa, a meditation practice that emphasizes truthfulness, compassion, and forbearance. Supported by an orchestra that uniquely blends Chinese and Western instruments, Shen Yun showcases folk and ethnic dances that present China’s rich diversity. Mrs. Barnett said watching Shen Yun gave her, “a deep respect for China’s history and culture that was already there” but which was new to them.